Corporations around the world are embracing virtual reality for training purposes. From retail store owners to executives on Wall Street, virtual reality has proven to be an effective way to prepare professionals for real-world scenarios. The same is true for caregivers now that Care Indeed has partnered with Strivr to provide Virtual Reality Dementia Training. Because dementia symptoms and behaviors are ever-changing as the disease progresses, technology has now become a catalyst to better train caregivers to provide the best possible care and Care Indeed is the first leading home care provider to utilize this technology. While standard caregiver training is based on lectures and role playing, the Virtual Reality Dementia Training is quite different. According to Care Indeed’s Business Development Manager Melissa Oakes, standard training is effective, but it doesn’t require the learner to immediately apply his or her knowledge in a realistic situation. “While other virtual simulations focus on creating empathy by having the learner experience what it is like to have dementia, our training focuses on how to interact with a client that has dementia,” said Oakes. And, empathy training is also a key focus. The training program powered by Strivr and offered by Care Indeed offers caregivers the opportunity to experience real-time scenarios. In simple terms, each caregiver is put directly into a care situation that he or she may encounter in the future. Wearing virtual reality headsets, the caregiver has the opportunity to respond to the patient and see first-hand how patients may react – both in positive and negative situations. Because dementia develops in many forms and the severity of symptoms are different for every patient, virtual reality training helps to better prepare caregivers for the unexpected. A patient may be struggling physically, emotionally or both, and during the virtual reality training sessions, caregivers can see how their approaches are successful or need improvement. Not only do caregivers learn to improve and enhance their skills, dementia patients also benefit from Care Indeed’s Virtual Reality Dementia Training, powered by Strivr. According to Oakes, the training was developed with core tenants from the Alzheimer’s Association and Teepa Snow’s Foundation – two of the trusted leaders in dementia training. The modules focus on “the dance” that caregivers must navigate in order to be successful with a client, said Oakes. “A skilled caregiver is talented at giving the client the illusion of control through narrowed choices and this skill comes from experience,” she said. The immediate rewards are both increased caregiver confidence and an enhanced skill set that benefits both the caregiver and the client. Virtual reality training allows for more visual learning in a risk-free environment. And, the caregiver learns to remain calm and collected in situations once they’ve experienced these scenarios in a risk-free environment. “When a caregiver is calm and collected, he or she can make calculated and proactive decisions while assisting the client,” said Oakes. Care Indeed’s VR training gives caregivers a chance to practice joining their client’s reality in a safe environment where mistakes won’t affect the client’s quality of life. Even though Care Indeed makes training a top priority, the organization began creating virtual reality training to fill a gap. “Caregivers go to a training, write notes, participate in a few role plays and then they go home and try to recall the information at a later date when they are in the moment with a client,” said Oakes. However, many studies show that learners lose 50 percent of the information within minutes of leaving a training session, especially when the training is not interactive. The Virtual Reality Dementia Training was developed to change that. Care Indeed is not only committed to high quality care, but also empowering caregivers with advanced training techniques that embrace technology. The goal with the Virtual Reality Dementia Training is to showcase the ever-changing nature of the disease and equip caregivers with the skills to respond with compassion. Training is at the cornerstone of what we do. Our caregivers are highly-skilled, but we believe that professional development should be a top priority. It’s inevitable that dementia patients will experience behavioral challenges, emotional outbursts and even mood swings. We believe caregivers should be exposed to this type of behavior and learn how to respond in the most effective way. With a commitment to professional development for caregivers, Care Indeed is proud to be the first in its industry to launch Virtual Reality Dementia Training. “The goal is to teach through practical simulation rather than theoretical concepts,” said Dee Bustos, CEO of Care Indeed. 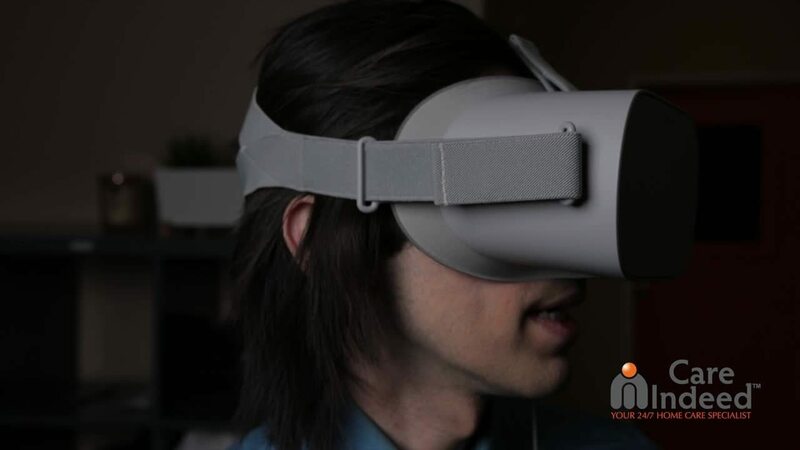 The partnership with Strivr to offer virtual reality dementia training stemmed from Care Indeed’s commitment to offer ongoing training and continuing education for caregivers, said Bustos. “Our caregivers had expressed their desire for additional training for them to effectively map out the best possible dementia care, so we partnered with Strivr and created the VR Dementia Training,” she said. The goal – for both caregivers and family members – is to ease the pain and improve quality of life for individuals with dementia. With the adoption of advanced technologies, Care Indeed is making this goal a reality. The program is already gaining recognition from leaders in the industry. "Kudos to Care Indeed for leading the way locally," said Larry Hayes, CEO/Publisher of ActiveOver50. For more information about Care Indeed’s Virtual Reality Dementia Training program, contact the business development team at (877) 504-3822.